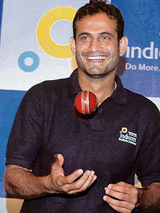 Beleaguered cricketer Irfan Pathan today stoutly defended himself against criticism, saying he remained positive about a successful performance in the World Cup despite question marks over his form and fitness. It should serve as a reality check — the true index of the character of a team. When faced with stronger rivals, Himachal Pradesh looked like a group of individuals lacking pluck as well as resolve. Indian women started their campaign on a winning note, defeating England by 18 runs in the opening match of the quadrangular series here today. Dissatisfied with Pakistan Cricket Board’s functioning, National Assembly and Senate standing committees on sports and culture will hold a joint session on Friday to question the PCB authorities on the team’s chances in the World Cup. Australian stand-in captain Michael Hussey has said Australia’s drubbing at the hands of New Zealand was due to bowlers’ failing to make breakthrough and not because of excess workload. Team India stumper Mahendra Singh Dhoni’s brilliant performance in the recently concluded one-day series against Sri Lanka has seen him overtake Australian skipper Ricky Ponting for the second spot in the latest LG ICC Rankings for ODI batsmen issued today. In-form Karan Goel hit a strokeful 111 as Punjab defeated Jammu and Kashmir by 84 runs in the North Zone one-day Ranji Trophy match at the Sector 16 Cricket Stadium here today. Orissa Steelers edged out Sher-e-Jalandhar 3-1 in the tie-breaker during the second leg of the PHL at the Sector 42 Hockey Stadium here tonight. The two teams were locked 1-1 at the end of extra time. It may come as a big surprise but the plain truth is that the world’s fastest 15-year-old swimmer is an Indian. With the aim of giving thrust to the anti-doping programme and to eliminate the vice of doping among sportspersons, the Sports Authority of India will organise a Doping Control Officers’ course and a Sampling Officers’ course for medical as well as non-medical personnel at eight SAI centres in March and April. Director Sports Directorate KU University Dalel Singh Chauhan inaugurated the annual sports meet of DAV College, Ambala City today. The meet will be concluded tomorrow. “I have been answering these queries about the loss of in-swing and drop in pace for a long time now. I am focusing on maintaining a tight line and length in my bowling before looking for swing or pace,” 22-year-old Pathan said at a press conference here. “In-swing or out-swing, it all depends on various factors like weather conditions and the pitch. I am trying to remain positive and concentrate on picking up wickets for the team.” The Baroda left-arm pacer was sent back home midway through the recent tour of South Africa with an advice to sort out his bowling problems. He was brought back for the last one-dayer against the West Indies but a soreness in the bowling shoulder prevented him from playing in the four matches against Sri Lanka, leading to a diktat from the BCCI that he should prove his fitness by playing in a Deodhar Trophy one-dayer before boarding the flight to the Caribbean. “I will be fully match-fit before the World Cup as we have four practice matches before the event gets underway,” the youngster put up a brave front. Pathan said he might have been robbed off vital match practice by the niggle but took confidence from his creditable show in the Ranji Trophy for Baroda during the brief lay-off from the Indian team. “There is no substitute for match practice. We can bowl any number of balls in the nets but there is not substitute for bowling in a match situation,” he said. Coach Greg Chappell famously said during India’s visit to the West Indies last year that Pathan was low on confidence. The 58-year-old former Australian captain has seen to it that Pathan had all help coming his way, including sessions with sports psychologist Rudi Webster and a number for former players like Andy Roberts, Jeff Thomson and Wasim Akram. Some have said that Pathan’s has been a case of too many cooks spoiling the broth but the bowler himself denied it. “Cricket is a game where we cannot stop learning. I will keep on consulting everyone and listen to everybody’s suggestion. But it is going to be up to me to decide what best suits my bowling,” he said. There was the inevitable question about his role as an all-rounder. “I have said many times that my primary role is the team is that of a bowler. It is God’s grace that I can also bat, and that is a bonus,” Pathan said. New Delhi: The BCCI today said that the Indian cricket team would wear the new light blue one-day clothing with some changes in the placement of sponsor logos during the World Cup in Caribbean. The BCCI had said earlier during the day that it had received a communication from the ICC that only the apparel approved by the world governing body could be worn by all the teams at the World Cup. It should serve as a reality check — the true index of the character of a team. 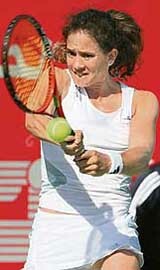 When faced with stronger rivals, Himachal Pradesh looked like a group of individuals lacking pluck as well as resolve. In their last North Zone Ranji Trophy one-day match at the PCA Stadium here today, Himachal restricted Delhi to 170 but were themselves shot out for 68, thus ending their campaign on an abysmal note. After finishing on the top in the four-day version of the Ranji Trophy in the Plate group, Himachal looked like a good team. But the euphoria proved short-lived against tough opponents in the shorter version of the game. Delhi skipper Virender Sehwag atoned for his poor display yesterday and played a useful knock. After a tentative prod off the very first ball towards the third-man area, which could have resulted in a similar first-ball dismissal as yesterday, the dashing batsman became disciplined. He was cautious playing deliveries outside the off-stump. Initial nerves settled, Sehwag found the Mohali track to his liking and the rival bowling attack toothless. In the process, he gained vital match practice and confidence ahead of the tougher tests. Sehwag looked like the batsman he was known not long back. He clobbered nine fours. When on 54, he was run out off a direct hit from short mid-on. No. 8 batsman Abhishek Sharma notched up a useful unbeaten 34 as Delhi were bowled out for 170. Though expensive, seamer Jitender Mehta claimed three wickets. Off-spinner Sarandeep Singh was impressive, claiming three wickets for 23 runs. Chasing this modest total, the Himachal innings never got going. Wickets kept tumbling and the whole side was bowled out for 68. Delhi seamers Ashish Nehra, Pradeep Sangwan and Amit Bhandari finished with flattering figures and bagged three wickets each. Sandeep Sharma, with 20 runs, was the highest scorer from the side, while Vikramjit Malik with 13 runs was the second-most successful batsman. Punjab and Delhi with identical 16 points each have qualified for the knockout stage of the championship. Brief scores: Delhi: 170 all out in 40.3 overs (Virender Sehwag 54, Abhishek Sharma 34 not out, Akash Chopra 24; Vikramjit Singh 3-59, Sarandeep Singh 3-23); Himachal Pradesh: 68 all out in 23.2 overs (Sandeep Sharma 20, Vikramjit Malik 13; Ashish Nehra 3-18, Pradeep Sangwan 3-26, Amit Bhandari 3-23). Set a target of 232 to win, England women collapsed from 117 for two in 30.1 overs to be bowled out for 213 in 48 overs. Atkins (54 off 99 balls) and Newton (21 off 33 balls) provided a good start. S J Taylor (26) and Edwards (33) consolidated the position before the visitors lost their way. Put into bat, Indian eves got off to a great start before they floundered the advantage and were restricted to 231. Woman-of-the-match KV Jain (77 off 119 balls) and J Sharma (61 off 91 balls) added 121 for the opening wicket in 30 overs to put the innings on a firm footing. Jain added a further 58 runs in 10.1 overs with skipper Mithali Raj (35 off 47 balls) before the home team lost wickets in the final 10 overs. For England, IT Guha bagged two wickets. Rebecca Roll’s unbeaten 104 off 87 balls gave New Zealand a rousing start, upsetting holders Australia by six wickets in the opening round-robin league match here today. The IIT Chemplast ground witnessed some sparkling cricket as the Kiwis, chasing a stiff target of 260 in 50 overs, reached 261 for the loss of four wickets in 45 overs. Rebecca, who is also New Zealand’s wicketkeeper, compiled her century with the help of 18 fours and a six, batting at No. 4. At the other end, Sarah J Suki, batting at No. 6, kept Rebecca good company, scoring an unbeaten 42 off 47 balls with the help of five fours. The two added 108 runs off 99 balls in an unbroken stand for the fifth wicket to help New Zealand gain the full four points, as the Aussie bowlers, medium pacers Catheryn Fitzpatrick (1-48), Emma Sampson (1-48), Kristen Pike (1-53) and left-arm spinner Shelley Nitscke (1-35) struggled to break the stand. Earlier, after winning the toss, the Aussies batted first to make 260 in the stipulated 50 overs, with No. 4 batswoman Lisa Sthalakar emerging the top scorer with 65 off 76 balls. She hit 11 fours. No. 2 batswoman Alex Blackwell (25), Shelley Nitschke (33) and Cathryn Fitzpatrick (33) chipping in. Shelly and Lisa put on 82 runs for the fifth wicket in 14.5 overs. For New Zealand, medium pacer Helen Watson was the most successful bowler claiming three wickets for 30 runs. Outspoken Senator Enver Baig said one could judge just how seriously parliamentary committees were taking the issue of cricket affairs by the fact that this was the first time a joint session was being held. “Definitely, we see the cricket scenario as a grave one. We are not satisfied with either the team’s performance, the way teams have been selected or the manner in which the Pakistan Cricket Board is being managed these days,” he said. “We want to know what chances do we really have of doing well in the coming World Cup after all it is a mega event and the entire nation is looking forward to it. Cricket has always been a matter of national interest for everyone,” he told PTI. In the past also the National Assembly and Senate Committee’s have held such sittings for cricket matters but so far have not been able to force any results. But Baig promised this time it would be different. “There must be an element of accountability for those running cricket affairs in the country,” he added. But PCB Chairman Naseem Ashraf may skip the hearing. A source in the board confirmed that Ashraf would not be attending the joint session and instead had asked the director of cricket operations, Saleem Altaf to face the music. “The guys were pretty keen to do well and someone like Mitchell Johnson, who played two of the games, he wouldn’t be jaded, he hasn’t played much cricket at all this summer,” Hussey said. “I don’t think that’s a reason. The Kiwi batsmen have certainly put them under pressure, and it just goes to show we have to execute under pressure. If we don’t, teams are going to chase down big scores,” he was quoted as saying by The Age today. Hussey said bowlers failed to make breakthrough and wasted the advantage when New Zealand’s top order collapsed in the last match of the Chappell-Hadlee series. “That’s the really disappointing thing. We had them 4-40 and for them to be able to chase down 350 is pretty disappointing. Dhoni overtakes Ponting, who did not play in Australia’s 3-0 series defeat to New Zealand and is now in third position. Another Indian to make rapid strides in the table is Yuvraj Singh who is up five places to 15th position, now just two places behind skipper Rahul Dravid. Goel was also associated in a 106-run partnership for the opening wicket stand with Ravneet Ricky (50). Punjab captain Pankaj Dharmani won the toss and elected to bat. Ricky and Goel gave them a sound start as they put on 106 runs before Ricky was stumped by Arshad Bhatt of the bowling of Pradeep Bali (1 for 27). Dinesh Mongia joined Karan Goel and they carried the score to 247 with a 141-run third-wicket stand. Karan Goel departed caught by Mahajan at long off of the bowling of all-rounder Abid Nabi (2 for 58). Goel made 111 and hit 10 fours and two huge sixes. Ishan Malhotra and Bipul Sharma remained not out on nine and 13, respectively. Punjab made 269 for three in 50 overs. In reply, Jammu and Kashmir were bundled out for 185 in 47.2 overs. Right arm off-break bowler Rajesh Sharma wrecked their innings by claiming four wickets for 25 runs. Medium pacer Gagandeep Singh got two wickets for 33 runs. Hardeep Singh (35, 3x4s), Kavaljit Singh (29), Dhruv Mahajan (26), R. Bisati (25) and A. Bhatt (20) were their main scorers. Punjab got five points from this win and Jammu and Kashmir one. Brief scores: Punjab: Ravneet 50, Karan Goel 111, Abid Nabi 2 for 58); Jammu and Kashmir: Hardeep Singh 35, Dhruv Mahajan 26, Rajesh Sharma 4 for 25). Ludhiana: Sumit Sharma (87) and Dhruv Singh (51 no) fashioned Haryana’s easy win by 112 runs against Services in the North Zone Ranji trophy one-day league match played at Punjab Agricultural University ground here today. Haryana won the toss and opted to bat first. They amassed 295 runs for the loss of four wickets in the stipulated 50 overs. Besides, Sumit and Dhruv, other notable contributors were Mahesh Rawat and Amit Mishra who remained unconquered on 42 and 45 runs, respectively. Services’ batsmen failed to cope up with accurate bowling by Sachin Rana and Amit Mishra as their innings folded at 182 runs after 42.2 overs. Sachin grabbed two wickets for 40 runs while Amit consumed four wickets conceding 29 runs. The win enabled the Steelers to bag two points, while the Shers got one point. The Steelers remain at the top of the table with 22 points, while the Shers are at second place with 17. In the shootout, the Steelers scored thrice while Shers did it only once. 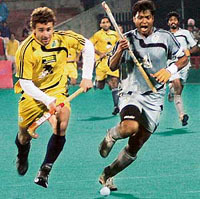 Dilip Tirkey, Birendra Lakra and Damandeep Singh scored for the winners, while Prabodh Tirkey missed. For the Shers, only Santi Freixa scored. The attempts of Baljit Dhillon, Tejbir Singh and Gurvinder Singh were brilliantly saved by Steelers’ custodian Salman Akbar. The last two strokes were not taken. In a power-packed match between the top two teams, the Shers failed to capitalise on a couple of chances that came their way. They had a golden opportunity to win the match in the dying moments but Tejbir Singh, who got a long pass into the circle, failed to make the most of it. He managed to dodge the goalkeeper but could not tap the ball into the open goalmouth. Thus, the match entered extra time. Thereafter, it was the Shers who called the shots and made repeated raids into the rival area but found stiff resistance from Dilip Tirkey and William Xalxo in the defence. Prabodh Tirkey, played an excellent game, thwarting many a raid. His precise distribution helped the Steelers keep their stronghold intact. When the Shers breached the defence, they found Akbar a tough nut to crack under the bar. However, the Shers got the equaliser in the 51st minute. Jarnail Singh got possession of the ball from the right and moved into the circle. He executed a powerful reverse flick towards the goal. With goalie Akbar covering the angle at the near post, Shers’ Spanish import Santi Freixa deflected the ball into the right corner (1-1). Steelers’ goalkeeper Salman Akbar was declared the Lion of the Day. The honour goes to six-ft-two-inch-tall Virdhawal Vikram Khade, who is the world’s fastest in his age group by virtue of his timings in three categories. Khade, born on August 29, 1991, clocked 23.92 seconds in 50m freestyle and 1m:54.18 in 200m freestyle at the recent National Games in Guwahati, where he bagged six gold, to go with his timing of 52.12 seconds in 100m freestyle at the Doha Asian Games in December. The 100m and 200m freestyle timings are the best Indian performances. “He is faster than any 15-year-old in the USA, Europe or Australia,” according to Virendra Nanavati, Secretary of the Swimming Federation of India. Khade has already surpassed the 2004 Athens Olympic qualifying time in two events and is at present the closest Indian male swimmer on the brink of qualifying for the 2008 Beijing Olympics, the window for which opens on March 15. “He is India’s potential Olympic medal hope in 2012,” said his coach Nihar Ameen, also the programme director and head coach at KC Reddy Swim Centre here. Khade owes his athletic frame to his father Vikram Khade, a reputed basketballer. But despite being built for the hoop game, as a boy, he was cajoled into trying out swimming at the PGT pool near his home in Kolhapur. With the aim of giving thrust to the anti-doping programme and to eliminate the vice of doping among sportspersons, the Sports Authority of India (SAI) will organise a Doping Control Officers’ (DCO) course and a Sampling Officers’ (SO) course for medical as well as non-medical personnel at eight SAI centres in March and April. Each course is for two days, and doctors recommended by the national sports federations would be admitted to the DCO course. The SO course is for non-medical personnel for candidates to be recommended by the regional centres of the SAI. The courses will be held at Kolkata (March 5 to 8), Imphal (March 12-15), Bhopal (March 19-22), Bangalore (March 26-29), New Delhi (April 2-5), Gandhinagar (April 9-12), Patiala (April 16-19) and Thiruvanathapuram (April 23-26). The Director, Sports Medicine (SAI), Dr PSM Chandran, said those interested in joining the courses should contact the national sports federations and the regional centres of the SAI. The SAI will also be organising DCO and SO courses exclusively for Army personnel in the Capital from March 6 to 9. Details of the course can be obtained from the Sports Medicine Centre at the Jawaharlal Nehru Stadium in the Capital. Chauhan while addressing the players said that the sport is also an important part of education which encouraged to work in a team spirit. He asked them to take part in various sports activities of the college regularly. He advised that they should not go for a short cut to achieve their goal. The principal of the college S. Nain welcomed the chief guest and briefed the achievements of the college. He said that the students have achieved many positions in academic as well as in the field of sports.